As a ‚fair shopper‘, going on holiday naturally means that I won’t head into high street shops just because I’m abroad. Gladly, there’s more and more fair fashion boutiques and vintage stores popping up all over the world. On my last trip to London, I got lucky at a charity shop and actually only brought back secondhand souvenirs. 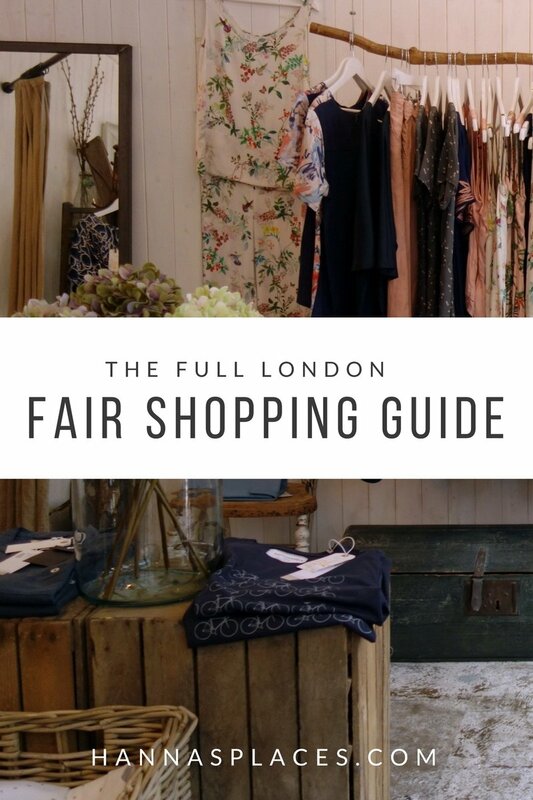 If you’re planning a trip to London soon, here are my favourite London fair fashion shops you need to visit. There’s probably tons more, so tell me in the comments if you’ve got more tips for me! One of the (small) disadvantages of ethical shopping is that you mostly have to order online. There just aren’t a lot of fair fashion labels on the high street! Gladly, there are more and more ethical boutiques popping up – and of course there’s a few cute London fair shopping boutiques as well. The Keep is a beautiful little boutique in Brixton Village. It’s a really cute store and they stock all kinds of different fair fashion brands from People Tree to Armed Angels and Beaumont Organic. If you only want to get something small, they also stock beauty products and accessories. Little tip: After browsing The Keep you can go to the other lovely stores in Brixton village or go for a coffee just round the corner! Another beautiful fair fashion boutique with really cool brands like Kowtow or CUS. It’s on Broadway Market so you should go on a Saturday and head to the market on the same day. It’s definitely worth it! PS: I also put The Third Estate on my list of London fair shopping places to visit, but didn‘ t make it there. If you try it, let me know! This isn’t actually London specific, but if you’re traveling to the UK (and you’re from Germany for example) you should know about charity shops. They are everywhere and they are so good (and cheap!). It doesn’t matter if it’s Oxfam, Save the Children or Age UK, the British charity shops are filled with knick-knacks, clothes and books – basically, a few of my favourite things. On my last trip to London, I scored a maxi dress and a linen blouse for 10 pounds only. I also buy loads of books at the charity shop, since they are mostly around one or two pounds each. What’s not to love? Great prices, secondhand/no waste and you help a great organisation as well! I can’t put in any recommendations in here since charity shops actually are everywhere. I’ve been successful in the ones around Clapham Common and Marylebone High Street, but you just need to go out and explore. + Blitz Vintage: This is a huge store just off Brick Lane. In case you don’t know, they always (!) give out flyer that give you 10 % off. It’s hard to miss the guys giving out the flyers, but you should definitely try and get one. + Rokit: There’s a Rokit in central London and on Brick Lane and both are great stores! They have all the current retro trends (especially long dresses and denim jackets) so you should be able to find something nice! + Reign Wear: I stumbled upon Reign Wear by chance and I’m so glad I did! It’s a smaller boutique in Chinatown/Soho with lots of luxury brands. My friend actually managed to get some original Chanel pumps for 80 pounds! These are my favourites, but of course that’s only a tiny part of London vintage shops, there’s so many more! If you’re looking for a shop in a specific part of London, Time Out has a great round-up. What are your favourite London fair shopping boutiques? PS: Want to know how to buy only souvenirs you won’t regret? I’ve got you covered!